Stay healthy this New Year with these CNY goodies! Check out these healthy CNY snacks to keep you light on your feet! We all know how sinful Chinese New Year goodies can be. With just a single pineapple tart amounting to 82 calories (think half a bowl of white rice), more and more people are turning to bakeries offering snacks with a healthier ingredient list. Hit up these places to get your sin-free fix! Delcie’s, with its eggless and diary-free products, has fast become a household name in the vegan community. 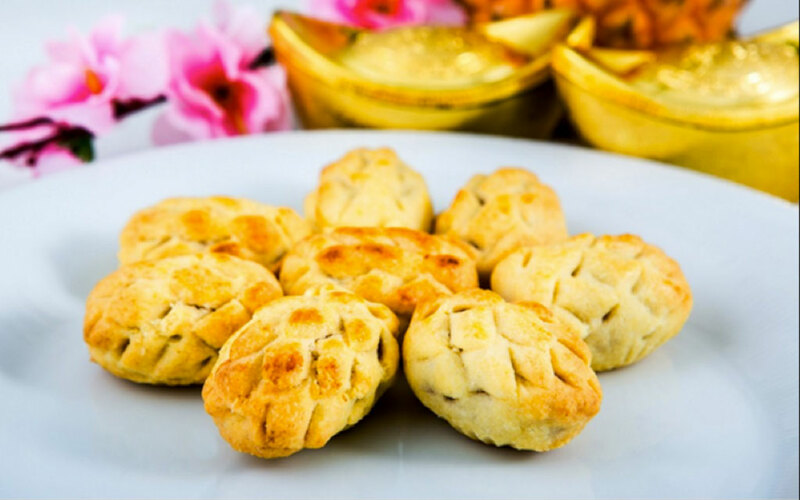 In fact, their love letters, pineapple tarts and most of their cookies don’t contain soy, nuts or gluten, making it the perfect destination for the health conscious. Owner Delcie Lam has also made sure to keep her baked goods organic, making them safe for customers with celiac disease and diabetes to consume! Apart from Chinese New Year goodies, Delcie’s also sells sweet treats from macarons to pudding cups and even birthday cakes! If you’re looking to spice up your CNY snacks this year, Cedele has got just the thing for you! It is now offering 5 different artisan cookies that are eggless and only made using unrefined sugar. Flavours include Chocolate Chip Macadamia, Pandan Chia Seed, Lemongrass Pistachio, Almond Crunch and Cornflakes. Not to mention their gluten-free Almond & Seeds Florentine, specially made with a medley of ingredients beneficial to your heart! There’s no doubt that the CNY snack which packs the most calories is the oh-so delicous pineapple tart. That’s why Sam’s Cake & Bakes has come up with a solution for the health conscious with their melt-in-your-mouth pineapple tarts that are eggless and free of nuts. Using all-natural and organic ingredients, Sisterfields is an online bakery that makes all their Chinese New Year cookies in small batches to ensure optimal freshness! Sisterfields’ CNY goodies contains ZERO preservatives, artificial flavouring and additives. Unique flavours such as Earl Grey Almond, Cranberry Orange and Brown Butter Chocolate Chip are available for preorder, a sure hit with family and friends!